Capt. Chris Martin proudly owns and operates Bay Flats Lodge in Seadrift, TX, overlooking San Antonio Bay. Chris has been fishing Texas Gulf Coast waters, from the Galveston Bay system to the San Antonio Bay system, since he was eight years old. "On Top of the World"
"Get Ready to get Muddy"
At the end of December the water temperatures in and around the San Antonio Bay region were already hovering around the fifty-five degree mark, and we should probably plan on things getting even colder by mid-to-late January. We could be experiencing true wintertime conditions by then which would, in turn, bring out avid trophy trout hunters all along the Texas coast. That's right! When the bay waters turn cold, coastal anglers from Sabine Lake to the Lower Laguna Madre will be "hog" hunting out of their boats. Their weapon of choice is usually one of their favorite six or seven foot fishing rods, and their arsenal normally contains a mixture of artificial baits to include dark-colored soft plastics, slow-sinkers, shallow running crank baits, and maybe even an occasional top water lure. It's a passion that's shared by many, and I'll be right out there next to them as they venture out in January. I love looking for cold water trout so much that I don't even mind having to deal with what can be sometimes harsh conditions associated with this time of the year. Some of the days might be long and gloomy with bitter winds and long periods of time between strikes, while other days might be bright and calm with relatively good action. But there will always be a couple common denominators affiliated with whatever type of winter day scenario I happen to be facing. The first is that I know I'm going to get a little bit dirty throughout my day of fishing, and the second is that I can probably count on being tired at the end of the day and maybe even a little sore the next morning. Why? Because wintertime wading means I'll be wading in mud that's anywhere from just a few inches to what may become waist-deep in depth while I search for these big winter fish. Needless to say, my equipment and I aren't always real clean when each day is done, and I realize it's a labor of love to hose-off my waders, all my gear, and my boat during periods of extremely cold temperatures. However, these tasks are all well worth the effort while knowing all the time that I've had an opportunity to chase what very well could turn out to be one of my career-best catches. All of a sudden, getting really muddy doesn't seem too bad to me anymore! Where do all the different bait fish and the trout go when the weather gets really cold? Well, I'm told that all but maybe just a few of the baitfish and shrimp species often tend to get swept out of the confines of the immediate bay system during colder weather generally due to stronger frontal passages and because of a strong tidal flows (especially low tide) that are often related to wintertime months. It's for this very reason that I will sometimes spend quite a bit of time during winter months scanning an area before anchoring and exiting the boat. Because the heavy bait action of summer won't be visible, I look for small signs like a surface swirl or a tail swirl, a bird or duck sitting on the water's surface, or even a flying bird that happens to set its wings while looking for food below. Other signs I'm sometimes forced to look for are those which can't be seen above the surface of the water. A good example of this would be me spotting large numbers of baitfish swimming beneath the surface once I'm out of the boat and already wading. Now then, as for what the trout do when it gets cold? Well, I truly believe that anyone who has fished our coastal waters for any fair amount of time probably knows by now that the trout seek the protection of deep water during prolonged cold spells. Keep in mind, however, that the use of the word "deep" here is a relative term – "deep" in one bay system will normally mean something altogether different for any other bay system. For example, deep water in some of our upper Texas coast bays might mean water depths from 10 to 20 feet, whereas in some of the middle and lower Texas coast bays deep water may be defined as being anywhere from 5 to 10 feet. Regardless, the trout look for deeper water when it's cold outside, and they'll be looking for that deeper water to be lined with some dark, sediment-rich, soft mud that will naturally retain the warmth of the sun's rays much longer over that of sand. When I begin working these areas with baits, I'll start by throwing soft-plastic baits and will slightly bump them across the mud bottom at the deepest point as I barely retrieve them. During brief warming trends between frontal passages, the trout will often venture to adjacent shallows located near the deeper water, so if I don't entice any strikes while tossing into the really deep water, I'll slowly begin working my bait across the drop-off or edge. Water clarity is another matter of importance for wintertime fishing. If the water is gin-clear and shallower, I often prefer bright-colored plastics attached to a very lightweight jig-head. If the water is off-color, I'll rig darker lures attached to jig-heads weighted accordingly based upon the depth of the water that I happen to be fishing in at the time. In any case, I'm more than looking forward to fishing during this upcoming winter, and can't help but think this may be one for the record books. I hope to see you out there! We hoping everyone had a safe and happy Christmas holiday and we want you to remember that it will soon be time to clean and store the guns as we rapidly approach the end of yet another fun-filled and successful waterfowl season. 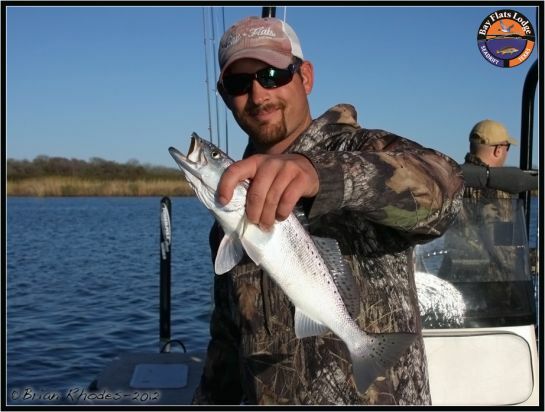 All of us here at Bay Flats Lodge wish you and yours a Happy New Year and an even better 2012 fishing season. Remember to practice CPR, "Catch, Photo, and Release", whenever possible on trophy Trout and Reds…Guide Chris Martin, Port O'Connor/Seadrift region. Good read...Great tips and information!